What does post-traumatic stress disorder stress disorder feel like? How about traumatic brain injury? I’m sure it’s different for everyone, but for Shon Wilson - a 15-year veteran of the U.S. Navy and U.S. Army who served in both Iraq and Afghanistan - the symptoms included depression, rage, nightmares, and hyper-vigilance. This makes sense. For months and even years on end while in combat, danger was around every corner. So when Shon came home, like many soldiers, this was difficult to turn off. Everyday things like walking down the aisles of a grocery store, or turning the corner in a public place, became terrifying ordeals. Fast forward several years, and meet Rommy – an amazing a labrador-poodle mix who accomplished what medications could not – helping Shon not just cope with these symptoms, but actually start to thrive. Rommy has also become Shon’s inseparable companion. They were connected by an organization called Freedom Service Dogs, and sponsored by Jets (former Broncos) wide receiver Eric Decker and his wife Jessica through their foundation Deckers Dogs. One of the many great things about Freedom Service Dogs is that they use rescue dogs, rather than breeders and puppy mills. They find that there are plenty of unwanted dogs in shelters that are eager to get a second chance, and a whole new career. I saw a great poster on the wall that had a dog in a cage with a caption that said, "Let me out, I have work to do!" 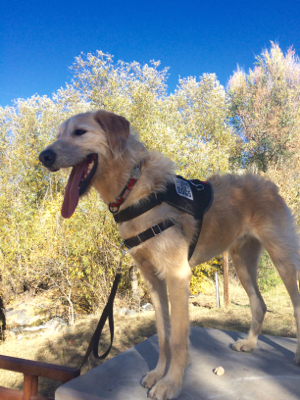 Freedom Service Dogs found Rommy through the Colorado Prison Trained K9 Companion Program. We had the pleasure of spending the day with Shon and Rommy for a feature story we shot for NFL Network. Deckers Dogs first aired on 11/12/15 (6PM EST in the Thursday Night Football pregame show.) And a longer version will be posted this weekend, and air on Sunday 11/22/15) at around 9:45AM EST on NFL Network. We'll add the link here once we get it. We filmed Deckers Dogs with our Sony F55 Digital Cinema Production Package, with Canon Cinema Prime lenses. Check out Freedom Service Dogs to learn more about this incredible organization, including how they train these dogs.